ONLY FOR SALE IN USA. The Field Calibration Plate allows you to quickly check the calibration of the entire Duct Blaster® System with DG-700 gauge. The calibration plate, which contains a 5 inch diameter hole, is mounted on the square transition piece that is connected to the end of the flex duct. 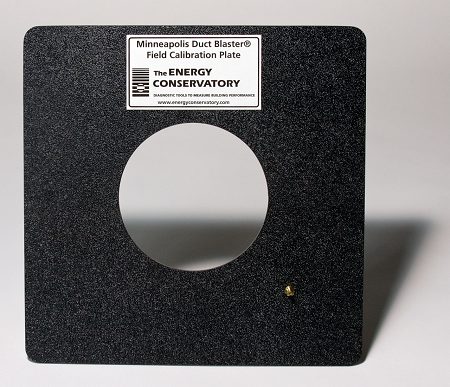 The Duct Blaster® fan is turned on to pull air through the calibration plate and simulate a duct leakage test. Results from the simulated test are compared to the known leakage rate to determine if the entire system is within a +/- 3% accuracy range. Can be used to document calibration compliance for testing programs such as California Title 24 and RESNET Home Energy Ratings.